Picnic season has finally arrived, hip hip hooray! What is your favorite picnic food? I would love to know. I am always looking for new and exciting treats to bring to my favorite summer activity. If you have any dishes you'd like to share, please leave comments below. In the mean time, in the spirit of kicking off the season of moveable feasts, I am going to share one of my most favorite picnic foods, Ruth's Curry Chicken Salad. To some this may sound boring and common, however, I promise, it is anything but. This salad is a medley of unique flavors that will satisfy even the snobbiest of chicken salad connoisseurs. It is my time-tested dish for summer gatherings, and, trust me, if you serve this at a picnic, there won't be any leftovers. My friend Ruth gave this recipe to my mother-in-law and I over a decade ago. At the time Ruth was our neighbor on Martha's Vineyard, happily living out her retirement overlooking Lagoon Pond. Ruth was an extremely special person, she was full of intelligence and wit, gracious to a fault, and had a life history more interesting than that of most world leaders. Born in Niagara Falls, Ruth graduated from Cornell in 1938 - a time when very few women graduated from college at all - with a degree in Home Economics. After college Ruth went on to live with her husband in Buenos Aires, where she occasionally dined with Eva Peron, travel to all seven continents and raise three successful children. Honestly, I could write about this fascinating woman all day, but I will save that for another time. Today I am going to share one of the thousands of treats she brought us from her warm family kitchen, her awesome salad. I first tasted this recipe when Ruth brought it to our Fourth of July buffet picnic. Upon first bite I knew it was the perfect chicken salad for me, and have been making it every since. I love that it's warm, sweet taste is purposely not dulled down with heavy mayonnaise. Instead, the ingredients are bound together with a tangy Greek yogurt sauce, which really allows the delicious medley of flavors to stand out and show their stuff. Plus, like all good salad recipes, this one has a good amount of flexibility. You can easily omit the peanuts, coconut or raisins, or substitute them for other popular salad ingredients, like green grapes or chopped apples. Additionally, you should feel free to adjust the amount of curry powder to suit your taste. We prefer it at a restrained medium heat, though some people like it fiery hot. The preparation of this salad is very straightforward and I am able to handily complete it during my daughter's afternoon naptime. This way, we are able to head straight to our picnic, food in the hand, the minute she wakes up. I hope that you have a fun picnic to attend soon, and that you choose to bring this salad. Ruth would be happy to know that everyone is enjoying her recipe, and I would be, too. 1. Saute the chicken strips in olive oil with the chopped onion and 2 t. curry powder. When chicken is fully cooked through, set aside and let cool. 2. Cook basmati rice according to package directions. 3. In a large bowl place the basmati rice, cooked chicken, cooked onion, scallions, peanuts, coconut, raisins and peas. Combine well with your hands or a large wooden spoon. 4. In a separate bowl, whisk together mayonnaise, yogurt, cream and remaining 2 t. of curry powder. Add more curry if you want the salad hotter. 5. Pour sauce over salad, mix the salad with your hands, or wooden spoon, until well-incorporated. Serving Suggestions: I like to serve this over salad greens when eating at home. If I transport it to a picnic I bring along a baguette to slice, along with a block of fresh Cheddar cheese and summer berries for dessert. Naptime Recipe Props: Chicken salad is easily one of the most popular dishes at summer picnics, and this one is top notch. Feel free to play with the ingredients depending on your tastes, like any good salad recipe, this one is flexible. Naptime Stopwatch: The preparation of the salad takes half of my daughter's naptime, which, in my opinion, is an hour well spent. The enormous amount this recipe yields is more than enough to feed the family for at least two days. Naptime Reviews: Both adults and children alike love to eat this salad. Sometimes the kids prefer it without the peanuts and raisins, so I just pick them out. Also, this dish is completely gluten-free if that is a concern in your household. My favorite picnic food is deviled eggs... it is a must have when the Burrall family goes to Tanglewood for a concert sitting on the lawn. Love summer in the Berkshires. I'm going to try Ruth's chicken salad this weekend. I had it many times in Ruth's home by the Lagoon, but never got the recipe, so thanks for doing it for me! I'm a Southern girl by birth (a New Yorker and Vineyarder by choice!) and have to admit that my favorite picnic food is fried chicken. Don't indulge that often, but it's probably my favorite food and easy to eat outdoors, except for the dipping it in ketchup part! Love your site. OMG! Thank you so much for posting this! We searched and could not find any of her recipes so this is a very unexpected and welcome surprise! It's so nice to hear how much you enjoyed spending time with her and the memories this recipe conjures. We definitely miss her and her hospitality! Now that summer is here it is time to start trying some recipes. Pesto is first on the list based on that I have a huge italian basil plant growing in the garden. I will stay posted ont he results. My husband makes the Barefoot Contessa's shrimp salad and also a yummy orzo feta salad with fresh herbs (basil, tarragon, parsley, dill) . We love packing it up and going to the pool with a few other families in the summer! Picnic at the beach, a basket with fresh baguette, tuna, egg, olives, and some crispy veggies and chips. Cool drinks, a bit of rose or lemonade. aha, a summer picnic sounds nice...when all this rain stops. This sounds great! We may just have to try it this week. As far as favorite summer foods- caprese salad, mango salsa, ANYTHING on the grill and homemade guac (well I love that at all times of the year!). Love your blog concept. 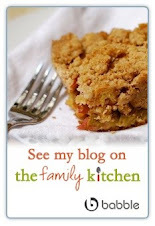 I get most of my cooking and now, blogging) done during naptime too!